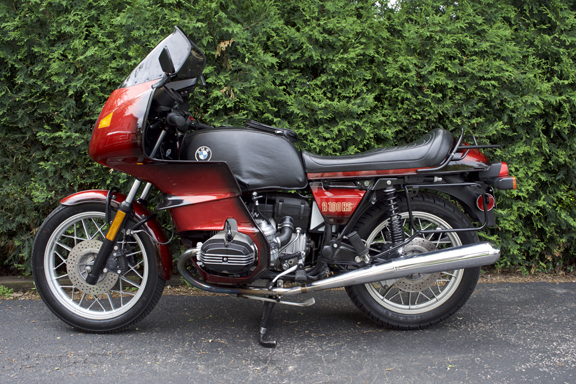 I’ve known for some time now that my ’81 R100RS with 28,000 miles on it was due for a rebuild of the cylinder heads. Valve adjustments were becoming more frequent. 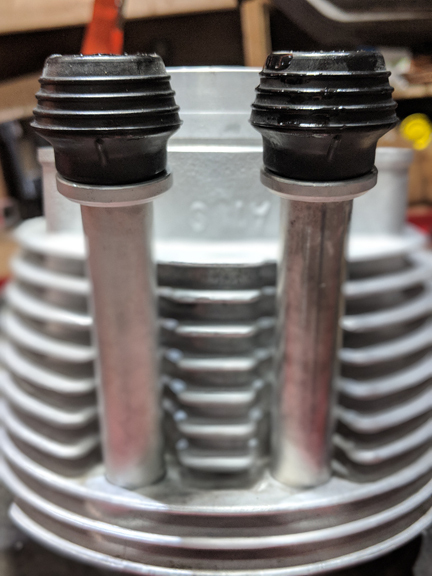 Given the known issue with valve seats the ’81 – ’84 airheads have, and the fact that a couple of the pushrod seals were leaking, I decided to jump into getting this rebuild done before the riding season began. Before I began, I ordered Oak Okleshen’s Top End Assembly Manual, for 1970-1995 airheads. It can be purchased for $30 directly from his wife, Carol, at 22637 Ridgeway Ave., Richton Park, IL 60471. Include a check with your request. 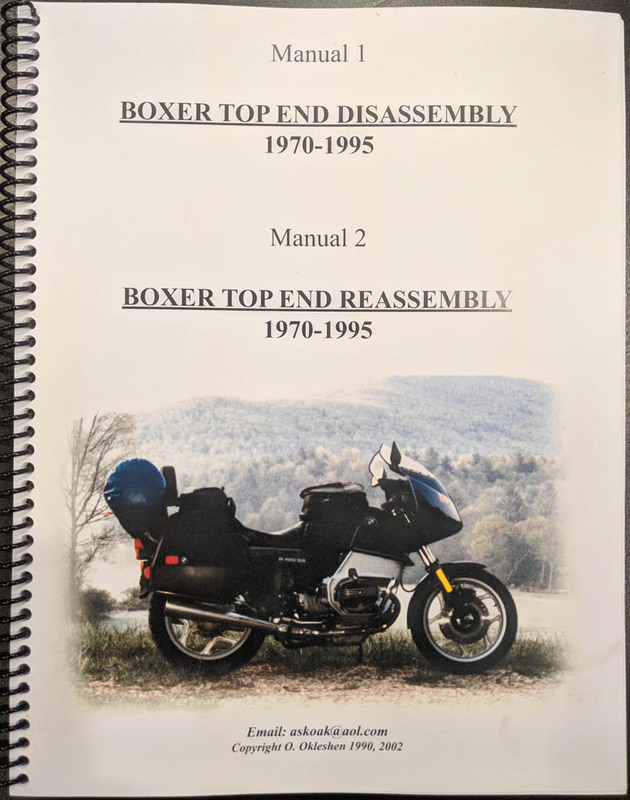 The manual is very extensive (45 pages) in the procedure for disassembling and reassembling the boxer head and cylinder with all the necessary adjustments. Disassembly is usually quite easy and straightforward compared to putting it all back together correctly. I started by disconnecting the negative wire from the battery. You don’t want any accidental energizing of the engine during this procedure. Position the bike so the rear tire is off the ground. I have a Renyolds Ride-Off center stand on this bike, so I had to put a 2x4 under each leg of the stand and then strap the front wheel down to the deck of my lift. Put the transmission in 5th gear. Removal of the lower fairing, cylinder bars, exhaust headers, and mufflers was done at this time. I was careful to keep the exhaust nuts labeled to their correct side. 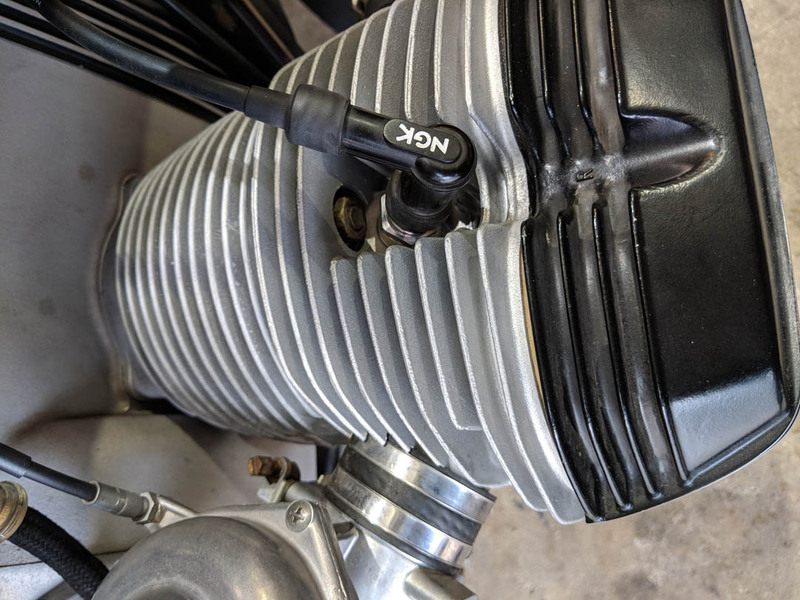 I disconnected the carburetors from the engine head and airbox and used wire to suspend them in place, making sure not to stress the choke and throttle cables. Proceed like you’re doing a valve adjustment. Remove both spark plugs. Remove both valve covers, draining the oil and wiping them clean. Be sure to keep all the parts from each side in their own container marked Left and Right. 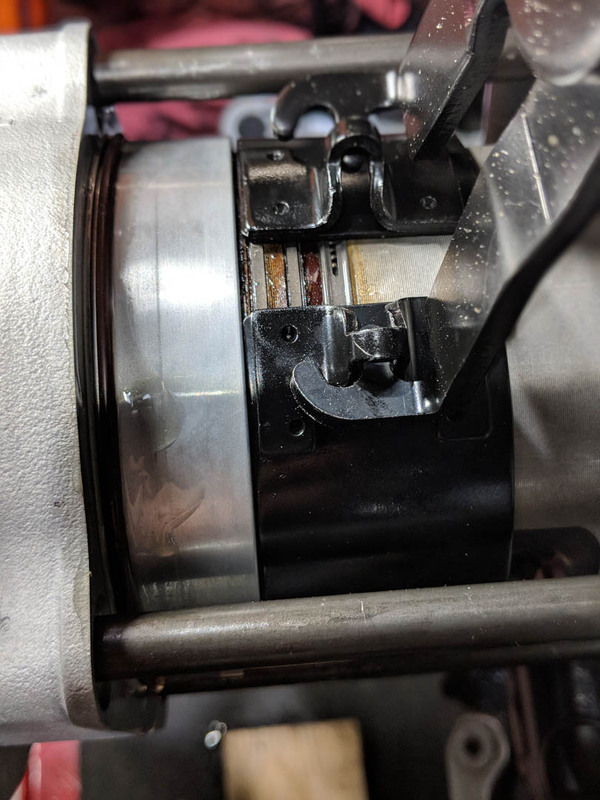 Remove the timing window inspection plug and bump the rear wheel forward until the “OT” mark on the flywheel is centered in the window. Check the pushrods on each side to determine which side you’re able to turn them with your finger (compression stroke). That’s the side to start disassembling. Remove the six head nuts in the pattern of 12, 6, 10, 4, 8, and 2 o’clock starting at 20 ft-lbs. and reducing by 5 ft-lbs. each round. The rocker arms can now be pulled off being sure to keep them intact. I put tape on each one marking them “L” or “R” and “exhaust” or “intake” and wrapped in paper towel, and I put them in the corresponding container. Pull the pushrods out and again, label them same as the rocker arms. 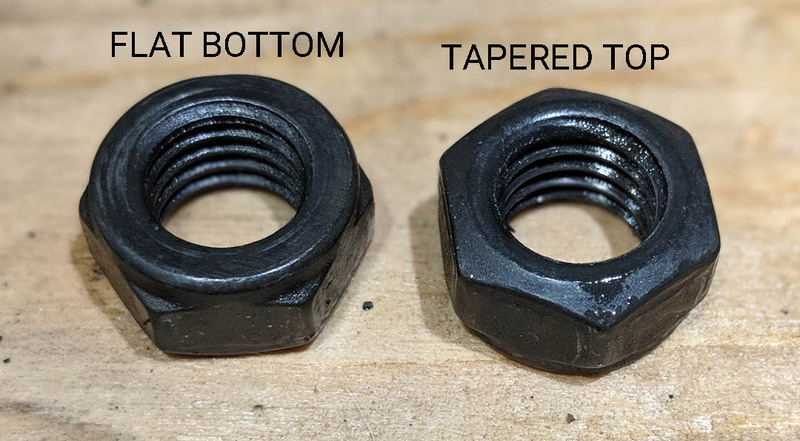 Also be sure to put tape around one end and label it appropriately, either “cam” or “rocker arm” so they go back in the exact same way they came out. The cylinder head can now be removed. Cut some cardboard to support/cradle the piston as you work the cylinder off. 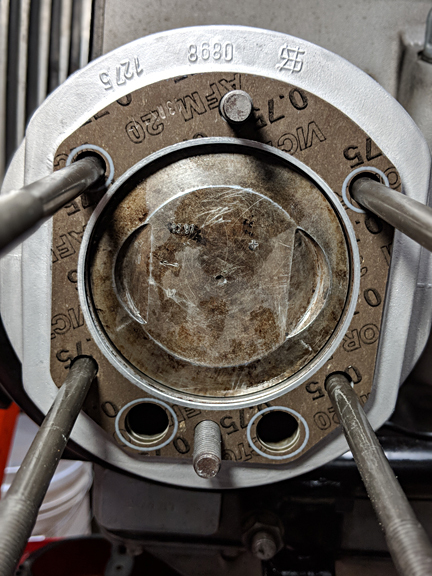 Once removed, I took a single edge razor blade and carefully cleaned the carbon off the top of the piston. Now, with one hand I helped guide the piston in and out, and with the other, I bumped the rear wheel again to turn the flywheel 360° and put the “OT” mark in the center of the inspection hole. 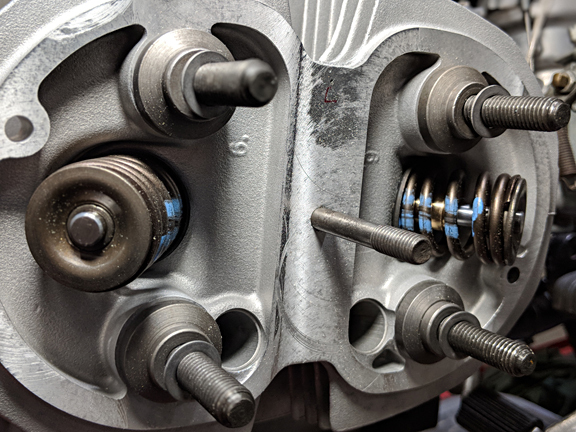 The push rods on the opposite side should now be able to be rotated with your fingers, as it’s on the compression stroke and pressure is off the rocker arms. I repeated the above disassembly procedure on the second cylinder, labeling and marking all the components. There are only a few places in the U.S. that specialize in rebuilding old air heads and they are the people you want doing the work. Not a job for your local mechanic. One of the best, if not the best, is Ted Porter, owner of BeemerShop, Inc. A very busy man with 35 years of experience, I found Ted to be very responsive to inquiries, knowledgeable, and ready to steer you in the right direction. His website is very user-friendly and customer service is great. I packed up the heads and shipped them off to California. In a few days, I received an email confirming they received the heads. A few days later, another email with a proposal for the rebuilding work to be done followed by a phone call from Ted. About a week later, heads arrived back all rebuilt and bead blasted! Now I had the cylinders to deal with. First, I wanted to get them looking as clean as the heads, but I didn’t want to take them somewhere to get bead blasted. I read a thread on the Airhead Beemers FB page about cleaning engine cases. Scot Marburger had reported good success with NAPA’s Aluminum Brightener. I sprayed the cylinders first with 409 All Purpose Spray Cleaner to cut the oil and grease. Then I thoroughly washed with soap and water. I did 2 applications of the NAPA brightener followed with a final wash with soapy water and rinse. 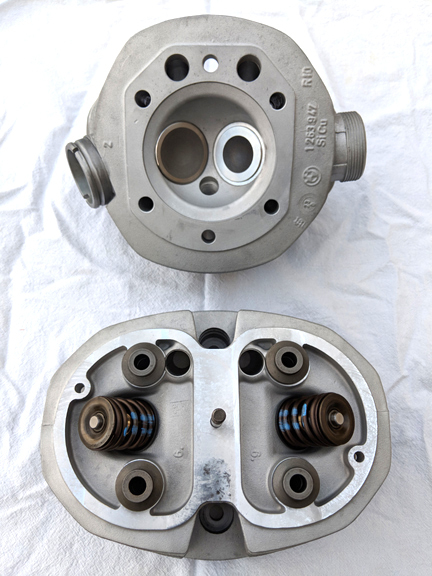 Here is a photo of the cylinder and head fully reassembled. The cylinders turned out just a tad brighter than the heads, but I’m pleased with the results. 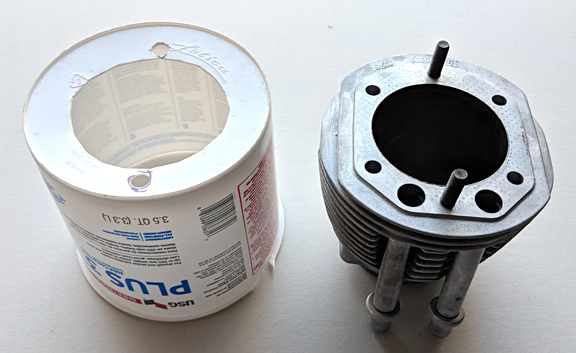 I plan to use the NAPA product on the rest of the engine case once it warms up enough to have the bike outside to hose off after application of the chemical. I decided to hone the cylinders and install new piston rings before putting it all back together. 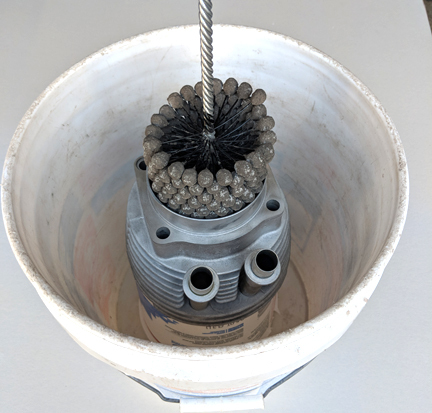 I went to Brush Research Manufacturing‘s website and ordered the GB Flex-Hone. Bore size: 95mm, Abrasive: Aluminum Oxide (recommended for Nikasil), Grit: 240. I took a 3.5 qt. plastic bucket and cut the top lip off. 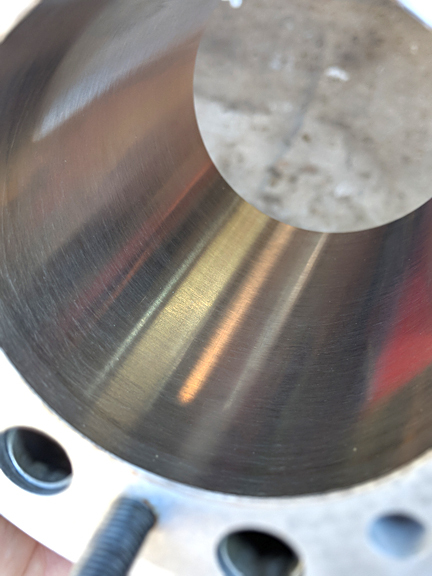 Turning it upside down, I traced the cylinder hole and studs and cut them out, making sure the cylinder hole was a bit oversized. In turn, this bucket was set inside a 5 gal. plastic bucket to catch the oil. Recommended speed for honing is 500-800 RPM using 60-120 strokes per minute. Honing time should be 20-45 seconds. I used 10W30 motor oil as lubricant. The ball hone self centers and is very easy to use. I honed 30 seconds per cylinder. After wiping all the oil off the cylinders, I washed them again with soap and water, drying them off thoroughly. 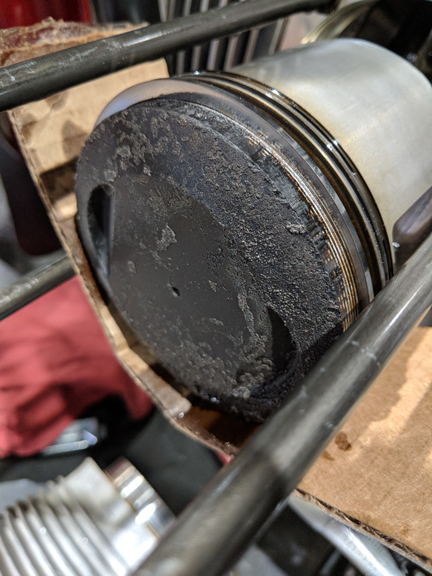 I put a very light coating of 3-in-1 oil inside the cylinder. I was now ready to reassemble. The pockets on the case where the push rod seals fit into were cleaned. I started with the side I last took the head and cylinder off of. The engine is still at top dead center for the compression stroke. I bought all the needed gaskets and o-rings from my local BMW dealer. Their parts guy, Dan, has become a good friend and is very knowledgeable on the airhead parts. The rings were purchased from Ted Porter. I applied a small amount of oil to the end of the pushrod tubes and the inside of the push rod seals. When you install the seals onto the tubes, be sure the fat side (lobe) of the seal is pointing down. There is a raised ridge/line on the bottom of the seal. I took the old rings off and carefully installed the new ones. 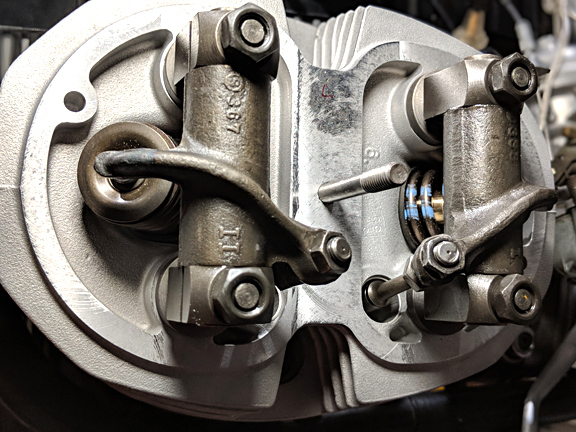 I used an Alltrade 940387 Kit 69 Piston Ring Compressor Tool Set. The inner two rings have a right and wrong direction. The oil control ring goes on first. I found it easier to remove the spring inside it, install it on the piston, then install the ring over the spring. The two ridges on this ring have a slight chamfer on one side and must face the engine block. The next ring installed is the nose ring. It also has a notch on one side of it that faces towards the block. The last ring is the compression ring. 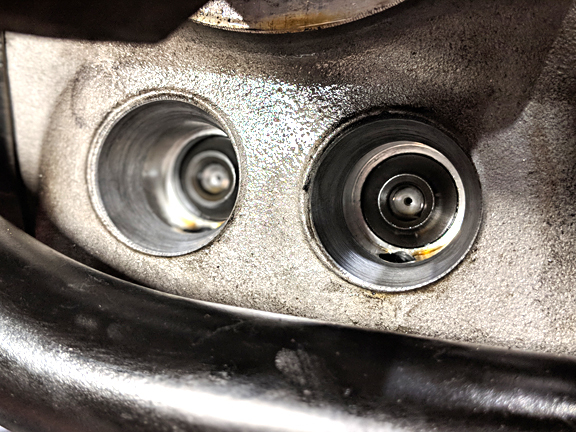 The o-rings were installed on the top two rods, the large one on the piston and the cylinder slid up to the piston, slowly pushing the ring compressor off the piston. The push rod seals were oiled, along with the cylinder o-ring, and carefully pushed into place. The head gasket was installed. Yes, there is a right and wrong side. It will only fit correctly one way where the pushrod holes line up. After sliding the head on, I installed the (4) shims onto the studs. These will make up the difference (.030″) that was milled off to remove the warpage. Pushrods were reinstalled paying attention to exhaust or intake and which end goes in the tube. Rocker arms were slid on and the nuts were hand tightened. The nuts have a right and wrong side as well. The flat side goes against the rocker arm support block. The upper and lower cylinder washer and nuts were then installed. These nuts were tightened first to draw the head and cylinder snug to the block. Setting the torque wrench to 10 ft lbs., all six nuts were tightened in the same order as they were loosened. Then 15 ft lbs., 20 ft lbs., 25 ft lbs., and finally 26 ft. lbs. I checked lash and adjusted as needed. Next, I set the valve adjustment. One side done! Now the opposite side was assembled in the same order after I turned the flywheel 360° to top dead center. Valve covers were put back on. There is no one universal path to breaking in a new top end job. 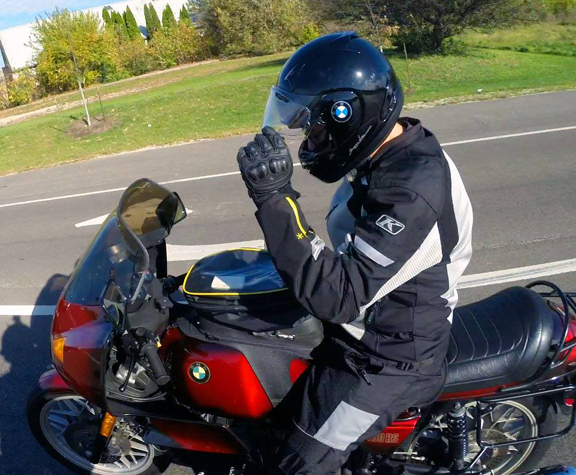 What I did follows what my BMW mechanic suggested. I reconnected the negative cable to the battery. 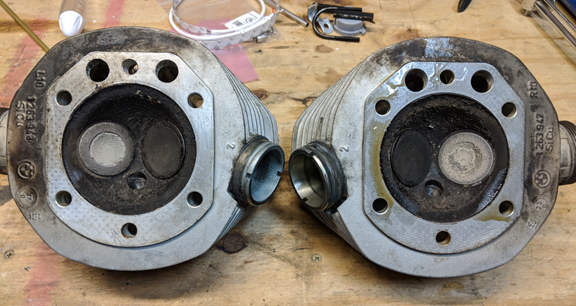 I removed the bowls on both carbs, poured out the gas, reinstalled. Made sure the fuel taps were off so the engine received no fuel and would not start. Press and hold the start switch and let the engine crank until the oil light goes off. About 10 seconds. Oil is now circulated through the engine. Next, open up the fuel taps. With the choke fully on, start the bike and run it for 60 seconds at 3,000 RPM. Remove valve covers and adjust valves again. They had tightened up. Now I took it for a 5 to 10-minute ride to get it fully warmed up. Back on the lift, cover off, I adjusted the valves again. They had tightened up a little. At this point, I will ride it for 600 miles and do another valve adjustment. They should be holding steady for longer periods of time. One thing I learned about setting valves, always push the rocker arm back against the push rod before setting the gap. This will push out the thin layer of oil at the bottom of the rod, giving you a truer setting.